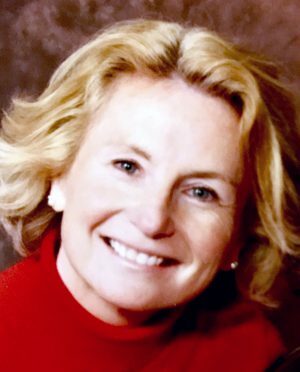 OSWEGO, NY – Billie Brady, 58, of Oswego, died Wednesday evening February 1, 2017, at home peacefully with her family by her side. She was born in Watertown, NY, the daughter of the late Robert and Marian (Fowler) Crandall. Billie had been a resident of Oswego for the last 37 years. She worked for Integrated Community Planning as the coordinator of the traffic safety board since 2003. Billie received her bachelor’s degree in English from SUNY Oswego. She was a member of Zonta Club of Oswego. Billie always cherished the time that she spent with her family and friends, especially going boating, walking, and watching the sun rise and set. She would say “Carpe Diem” “Seize the Day” and enjoy every minute. Billie is survived by her beloved husband of 37 years, Dennis Brady of Oswego; their loving sons and daughter-in-law, Griffin and Pamela Brady of Buffalo, Nathan Brady of Tennessee; her precious grandson, Cormac Brady; her devoted and beloved family, brothers: Peter (Linda) Crandall of Rochester, Gregory Crandall of Florida, and Kris (Amy) Crandall of Clayton; brothers-in-law and sisters-in-law: Tim (Peggy) Brady, Kevin (Lynda) Brady, Patricia (Debbie Finch) Brady, Vicki Brady and Gary (Michelle) Brady; her aunt, uncle, several nieces, nephews and cousins. Funeral services will be 10 a.m. Friday, February 10, at St. Mary of the Assumption Church, Oswego. Calling hours will be Thursday, February 9, from 4 – 7 p.m. at the Sugar & Scanlon Funeral Home 147 W. Fourth St., Oswego. Spring burial will be held July 29, at Glenwood Cemetery, Watertown. In honor of Billie’s philosophy and work ethic safety came first especially with children. In lieu of flowers, please consider donating a bicycle helmet to be placed at the funeral home, then they will be given to those in need which continues her work and passion, or contributions may be made in Billie’s name to Friends of Oswego County Hospice, PO Box 102, Oswego, NY 13126. Billie will be forever missed in our community. She was a wonderful soul, with an infectious smile. Prayers sent to her family and friends. Dennis and familly. So sorry to hear of Billie’s passing. I always enjoyed working with her because her energy and enthusiasm were contagious. Our thoughts and prayers are with you. Dennis and family–I am so sorry to hear that Billie passed. I always enjoyed working with her because her enthusiasm and positive outlook was contagiious. I consider myself fortunate to have known and worked with her. Thoughts and prayers are with you. Very sorry to read about the passing of your wife Billie; last time we saw you both, at the cayak event, I remember her taking pictures of the participants. Our thoughts are with you and your family. I’m very sorry to hear the news about Billie. A great wife, mom and best friend will truly be missed. Our thoughts and prayers are sent from Minnesota and are with you Dennis, your family and the entire Brady family.